Parking is available along North and South Trade Streets, on McCown Street, behind Bank of America, behind the Episcopal Church, and across the street from the Congregational Church. And as you turn off Trade Street and drive up over the railroad tracks by Morris the Horse on Pacolet Street, take the immediate right fork before the buildings start on Pacolet, and there is a parking lot back there. You'll park just once for all of Super Saturday's activities. Click on the numbers below to identify each venue. What time should we arrive? You want to allow time to park and walk to your venue. A good rule of thumb is to arrive half an hour before your first show in case you end up parking some distance from that first show. That way you won't be rushed, and can get to your first venue in plenty of time to be seated when the show starts. Where can I get food and drinks? The best place to buy your lunch and beverages is at the Food Court located above the parking lot of the First Baptist Church (see 3 on the map above). Hot dogs, hamburgers, pizza, BBQ, ice cream, snack packs, water and soft drinks are on sale from non-profit organizations that work with children. After buying your food, you can sit in the amphitheater beside TFAC and watch free entertainment on the Community Stage. Bottled water is also available for purchase on Melrose Avenue as you watch the free entertainment there or walk to your next venue. If you want to have a sit-down lunch within walking distance of Super Saturday's action, you will find several restaurants along Trade Street. A small army of volunteers makes Super Saturday possible, some helping for a few hours, some helping for a few days, or some for many weeks. No matter what, we can use your help. 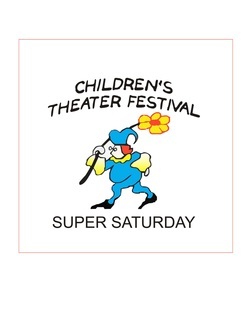 Call 828-283-0379 for specifics, or email supersaturdayinfo@gmail.com. And thank you!